Voice Biometrics Conference London is set for November 28-29, 2007 at the Grange City Hotel London. The theme for this year is “Achieving Global Acceptance.” Topics to be discussed include: biometrics basics, supporting mobile payments, applications in financial services and law enforcement, leveraging security infrastructure, and the user experience. Speakers include Nick Ogden, CEO of Voice Pay, and Mark Pewlewski, Technical Group Leader for British Telecom. Sponsors include VoiceVault, Agnitio, Nuance and PerSay. Global plans … Global exposure. Those are the two forces accelerating deployment of biometric solutions for both authentication and identification around the world. As examples of the global plans, U.K.-based Voice Pay has initiated a voice-biometric based system that enables secure card-based payments from any phone. This greatly expands prospects for friction-free use of spoken words to authorize phone-based payments. Other examples include customer-facing deployments in banks (such as ABN AMRO in The Netherlands and Israel’s Bank Leumi) and large telephone companies (such as Bell Canada). Global exposure is a corollary to expanded deployments. Security breaches across all manner of commerce and payments systems have greatly stepped up the average person’s exposure to identity theft. When it comes to commerce carried out over the telephone, the use of voice-based biometric characteristics to identify or authenticate customers only makes sense. 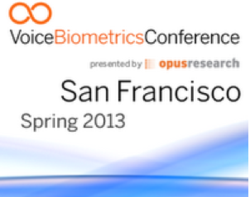 It is with this theme – “Achieving Global Acceptance” – that Opus Research is proud to announce Voice Biometrics Conference London (Nov. 28-29, 2007 – The Grange City Hotel London). Building on the success of last May’s Voice Biometrics Conference Washington, DC, VBC London will showcase real-world implementations of biometric solutions to support financial services, payment systems, customer care, law enforcement and government services. It will bring the major voice biometric technology providers – along with their partners, customers and prospects – to showcase their wares, address common concerns and describe the advantages and opportunities surrounding voice biometric deployments. “Biometric Basics” – Definitions, applications, approaches and a look at the state of technology and global markets. “Supporting Mobile Payments” – Mobile devices are notoriously non-secure, subject to fraud and easily lost or stolen. Hear how voice biometrics can support high-levels of security to support mobile payments. “Applications in Financial Services” (Case Studies) – As early implementers, commercial banks and credit card issuers have tackled the most vexing challenges surrounding implementation of speaker verification and caller authentication. “Leveraging Security Infrastructure” – The most successful and cost-effective implementations of voice biometrics most often extend existing infrastructure for information security and access control. “Applications in Law Enforcement” – Voice biometrics is playing a higher-profile role in tracking down and identifying criminals around the world. “Focus on the User Experience” – This session is designed to put a focus on the most important people in the voice biometric equation: callers. Confirmed speakers include Nick Ogden, CEO of Voice Pay, and Mark Pewlewski, Technical Group Leader at British Telecom, as well as solutions implementers and thought leaders from IBM and ABN AMRO. Check the conference Web site for news regarding new speakers and presentations. The global roster of sponsors includes VoiceVault, Agnitio, Nuance and PerSay. In order to qualify for the special early-bird rate (?499) for the Voice Biometrics Conference London show, please register now!